Darren Young says his East Fife side is starting to come together as their season progresses. 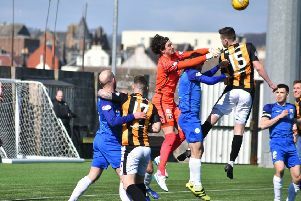 After a shaky start to the campaign the Fifers made it three wins in a row after coming back from a goal down at New Bayview to claim at 2-1 League One win over Airdrie on Saturday. “I think we maybe deserved the victory in the end,” the Bayview boss said. “We created the most chances and at the end we had another couple of opportunities to score. “It was a mistake from Brett Long that gave them the lead and after that I think he had one other save to make during the whole game. “Going forward and defending as a unit I think we were pretty solid. There wasn’t much in it during the first half and going into the second half I knew we had a good bench. Young hailed his side’s resilience in coming back to win the match after falling a goal behind. “It was a real team effort,” he said. “We have a togetherness. We came back from behind against Partick last week and did it again this week. The victory lifted the Fifers off the bottom of the league table and Young says he feels that his team have played well so far this season and were in a false position. “The only game we’ve let ourselves down this season has been the Brechin game,” he added. “We’ve been in every other game and there’s been an opportunity to win. “Even in the 3-0 defeat at home to Arbroath we had twice as many chances as them. We had 18 shots, they had nine and we got beat 3-0! “The fact was we knew we were creating chances – it was individual errors and mistakes that were causing us to lose goals. “But we’ve got a full squad back fit now so everyone is fighting for their place. “There’s nobody there resting on their laurels. It adds to competition and keeps guys on their toes. If you look at it we’ve got a few guys still with us from last year, but under different circumstances. Kevin Smith is back from injury, for Anton Dowd it was a big jump up from playing for Heriot-Watt University but he’s now taken to it well. “Jonny Court had never really had a run but he’s doing well, Mark Docherty’s coming back, Scott Linton is coming back and Darryl Meggat was out for a bit last season as well. “So there’s a few guys still to quite get there, but overall we’re delighted. Young said he was delighted to see on loan striker Rory Currie score the winner – his second goal in two games after joining from Hearts. “He’s a young kid with a really bright future,” Young said. “He started off really well and played the first few games. He was just unlucky that Hearts recalled him, so he lost his place in the team because other players came in and did very well. With three wins in a row Young says he’s hoping that the run can continue. “Winning is a good habit to get into. It gives the players that bit of belief. It means that if we do go behind we can still go and grind out a result. “At the same time, we’re passing the ball well, the number of chances we’re creating is great and the goals we’re scoring are really good. East Fife will now look to make it four wins in a row with a tricky away trip to Stranraer this Saturday, whom the Fifers could leapfrog in the league table if they take the three points. “We’re looking forward to it,” Young says, “The team at the bottom of the league could theoretically be in third place by Saturday tea time depending on results! It’s that close. “All the games are tough but, if we go there with the same attitude, work rate and determination, there’s no reason why we can’t get another result and continue this run. “The fitness levels for me are amazing. We know we could probably be a wee bit more ruthless in killing teams off, but I’m not going to complain because we are creating the chances.